Nothing is more disappointing for clients – or interior designers – than stunning schemes which have taken months to plan then disappointingly fail to live up to expectations (or worse, simply look dreadful) when the lights are switched on. The secret ingredient to maximising painstakingly-designed features, including Artwork, is good lighting – and it doesn’t have to be expensive kit, just carefully considered and well placed. Cornflake’s team of professional lighting experts work closely with top interior designers and talented artists to help them deliver wow lighting schemes designed to enhance colours, sheens and textures. Pre-set scenes quickly allow homeowners to capture a favourite mood at the touch of a button… and repeat it whenever they like. Whether you are settling down for calm evening relaxation or chatting mid-morning over coffee, good lighting has a huge impact on a scheme… and it shouldn’t be difficult to achieve. 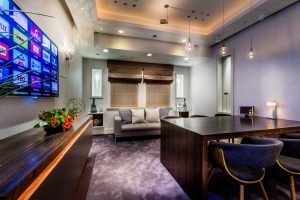 To illustrate the vast difference between good and poor lighting, and its dramatic impact on furnishings and wall-coverings, the company has even built a realistic ‘home’ showroom in central London to visibly demonstrate the point. The 4000sqft subterranean Smart APPartment, like so many clients’ properties, is located deep below ground in a huge basement with no natural daylight. A lighting challenge in its own right. Expert lighting consultant Katie Payne says: “The fire officer responsible for signing-off the SmartAPPartment asked if he could ‘step outdoors to check the balcony!’. The faux windows; natural daylight lighting and clever skylights obviously did the trick, and are testament to modern lamps and lighting skills. Regardless of your home’s location, lighting should always be carefully planned to bring design schemes to life and maximise the décor investment,” she adds. Particular attention was paid to the apartment’s dining room, (pictured below). 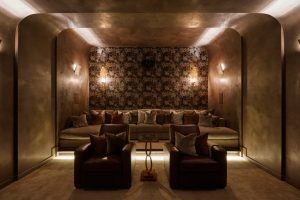 Over 40 circuits enable Cornflake’s team to showcase pre-set lighting scenes and demonstrate clever techniques to illuminate the specially commissioned design features; such as the tactile snakeskin-inspired anaconda wallpaper. 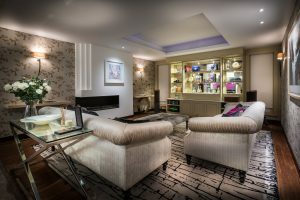 The dedicated room features more than 100 different lamps, alongside a wide range of switches and dimmers, plus a unique shaded wall to showcase LEDs, across a wide price range. 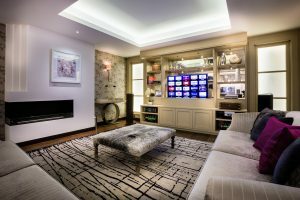 In the purpose-designed showroom, home owners are proactively invited to play with the lights to help make informed decisions for their own properties. Attention to finishing is critical at this level. 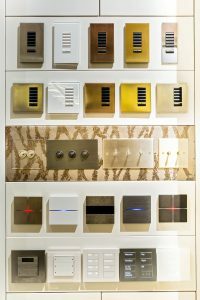 Colour coordinated light switches and stylishly plated dimmers, or traditionally styled flick switches hiding modern controls, are just some of the many bespoke options now available to discerning homeowners and highly dedicated designers. 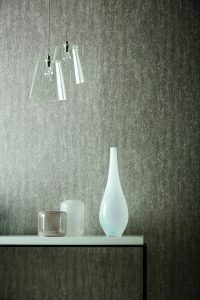 Ruth Wright, from leading manufacturer Anthology Wallcoverings , concurs textured and metallic wall finishes are here to stay and will often benefit from clever lighting. She says: “Our designers draw on tactile, organic and tessellating shapes to create structure and form. The Anthology collection, as featured in the dining room, showcases creative finishes, subtle textures and complex backgrounds. Designed to have an international appeal, these stunning papers combine the feeling of extreme luxury with the edginess of industrial chic. Good lighting helps to emphasize the subtle nuances and creates added interest in any space”. With trendsetters predicting luxe schemes are set to continue for a some time; especially as the dark nights start to draw in. 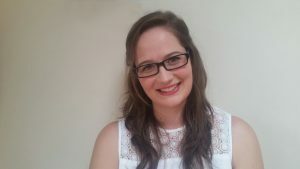 Katie (below) offers a few salient tips to achieve maximum bang for your design buck. • A central pendant should not be your lighting scheme’s starting point. When you enter a room you don’t look up at the ceiling. Walk into each room and try to see it a fresh, noting where your eye lands first. Highlight hero walls and key features with spots, and brighten dark corners with subtle lamplight or downlights. Plan walls first, then the ceiling lights. • Dimmers, dimmers, dimmers! A wonderful invention that can transform a room cheaply and quickly. Dimmers cost just a few pounds these days and can be retrospectively fitted with minimal fuss, ask your local electrician for advice and book an appointment ASAP to turn down the glare. • Don’t blow all your budget on one room, you won’t reap the benefits as you move around the house. A good scheme should flow seamlessly between rooms, especially in connecting spaces, such as hallways and stairwells where lack of attention is most glaringly noticeable. • Don’t put all your lights on one switch. Mood lighting is great for dining rooms, bedrooms and dens where you want to light up, or dim down, the temperature depending on what’s taking place. Having to have all the lights on at full blast will spoil the moment faster than you can find a candle. Ask your designer for advice on splitting the lighting into separate circuits to enable greater control and flexibility. • Many of us hang artwork where there is a light; but this is not the best way to curate your life. Rather, plan your lighting scheme around your art and treasured objets to ensure favourite pieces are beautifully lit and highlighted to best effect. Put lights where you want to hang pictures, not the other way round. 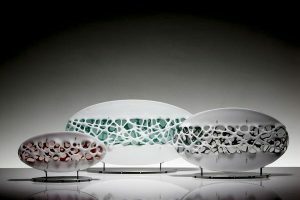 (Pictured, lace glass sculptures by Tracy Nicholls). • Summer entertaining in the garden needs great lighting. Nothing kills a party faster than the sun going down followed by pitch darkness. There are many fun outdoor, weatherproof, lighting options available to suit every party tempo, whether you are star-gazing, barbecuing or chillaxing in a hot tub. Controlling the lighting from your smart phone is also a cool party trick. • Feeling low or depressed? It could be your lighting. Check bulbs are warm and bright – many cheaper ones emit a low grey light which can dampen spirits and zap energy. Daylight bulbs are growing in popularity due to their health giving properties, but don’t rush in and change all your bulbs in one hit. Take time to research circadian rhythms and work out which rooms you use most at key times of the day then prioritise these to deliver a new burst of energy. In summary, to enhance sheen and turn up the glamour stakes – simply add light. Just make sure it’s the right light. Katie is employed by Future Light Design, a preferred lighting partner of Cornflake. She is often found in the SmartAPPartment waxing lyrical so do please book an appointment today if you’d like practical help and advice to light up your luxe. Big thanks to all the companies whose goods are displayed in the dining room. Fabric blinds: JAB. www.jab.de. 020 7348 6620. Info@jab-uk.co.uk. Bespoke walnut furniture: Ecoism Manufacturing Limited. 01959 570 550. www.ecoism.co.uk.